When something is rigged, it has been fraudulently manipulated by someone to get their desired outcome, e.g., the game was rigged in favor of the home team. 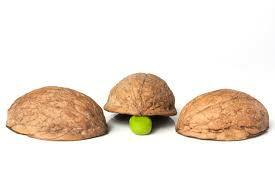 Where does rigged come from? Rigged has nothing to do with the rigging on boats or big rigs on the highway. This rigged, dated in this form in the mid-1800s, is unrelated and its origins are obscure. In the late 1700s, lexicographer Francis Grose defined a rig as “fun, game, diversion, or trick,” which was extended “to deceive.” This rig may come from thimblerig, an early version of the shell game con. In the 1800s, rigging specifically referred to stock fraud, e.g., a rigged stock. In the 1900s, rigged was especially used of sporting matches (like the 1919 World Series) whose winner was fixed in advance, usually by players getting money to lose on purpose. In the 2000s, rigged was increasingly used of political or social systems. 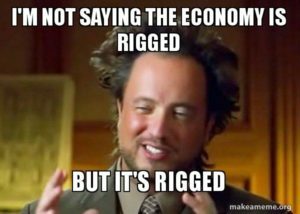 Presidential candidates Bernie Sanders notably campaigned on repairing a rigged economy in favor of the rich while Donald Trump thundered on about the election being rigged in favor of Hillary Clinton. 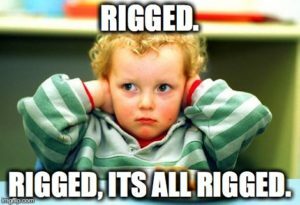 Calling something rigged is often used in everyday speech or writing by people who think an outcome has been fixed ahead of time so they lose. As noted, sports matches are often discussed as rigged, such as the 2006 Italian football scandal. This involved teams and referees fixing matches for financial gain (to deliberate losers). Rigged, as also noted, came into the spotlight during the US presidential election, a favorite claim of Donald Trump, who lied that the election was rigged so Clinton would win. Many now believe, ironically enough, that the election was in fact rigged, with Russian meddling helping Trump win.